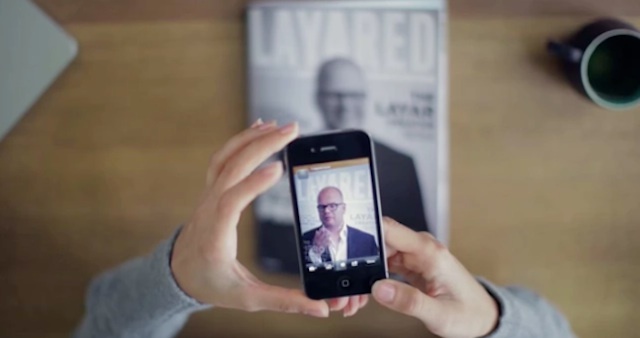 AR firm Layar reveals Creator–an attempt to turn printed material into a portal to digital content. Harry Potter’s animated newspapers may yet be real. Augmented reality technology is hot right now, due especially to Google’s Project Glass, which is developing wearable AR tech. But Layar, one of the biggest players in AR systems for smartphones, has set its sights on energizing an old technology, print, with AR. It’s just released Layar Creator, a web-based app that turns dead printed pages into portals for digital content. Think Harry Potter’s newspapers meets the 21st century, as you watch the promotional video. The idea is to “demystify” making interactive content for existing print magazine industry players–the web app is designed to be easy to use with a drag-and-drop interface so that you can add interactive links, video, social media interactions, and even “buy” buttons into an AR portal that the end-user consumer will see when they activate the relevant AR app on their phone. In some ways it’s like the kind of digital interface available through the use of QR codes–which are machine-readable 2D barcodes that can, when viewed through a smartphone app, take the user to a specific URL that is “triggered” by the code. In this manner QR codes are handy to quickly take viewers of print ads directly to the websites where they can find more information or even buy material. But Layar’s image recognition systems built into Creator mean you don’t have to actually embed a QR code or any other system in your page–the page itself is the key to additional digital content. The company’s been working in AR for three years, and cofounder Maarten Lens-Fitzgerald explains that it’s the culmination of this work and the input of 20 million users and 17,000 developers: “We know where people will learn about augmented reality: Print!” In order to get publications aboard, Layar is even making full access to Creator free until August 1st–and notes that it has very little impact on the usual design workflow of a magazine, and when it becomes a paid-for service it’ll have a number of pricing structures, including free ad-supported options. The system is bound to come under some of the same criticisms that AR as a tech often faces–that it’s gimmicky, or that it’s clunky for users to interact with and doesn’t necessarily add editorial value to the content. But Layar has obviously worked hard to lower the barrier for both the print industry and the end-user to enjoy this tech. (Perhaps the company’s even read our plea for more innovation in the print industry, slow to drag its heels into the digital era, and realized AR is one way to make it happen.) With Google’s Project Glass around the corner, AR interactions such as this will only become technologically easier. Don’t be shocked if they become more common, as well.